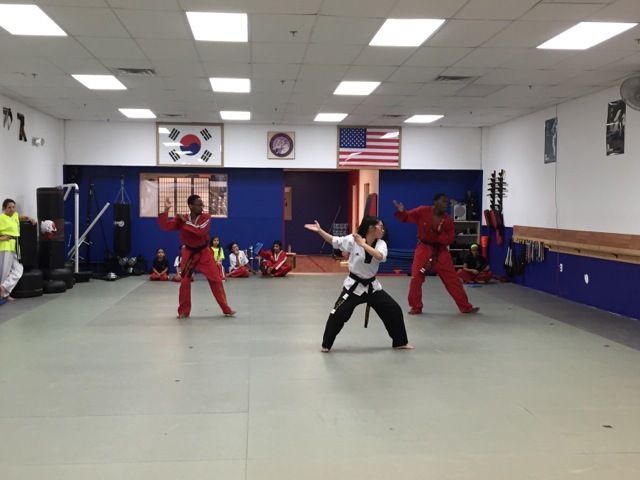 Hapkido students at Be Ryong did a demo during yesterday’s Open House. This was the largest group of students to do a demo since we can remember! Watch the video to see some amazing techniques, including Jess breaking a cinder block with his elbow, Chris and Dave throwing each other around, and some white and orange belts demonstrating arm-breaking techniques.. Thanks to everyone who participated this year! All classes, all day, open to the public for free. No need to register. Just come 10 minutes before the class starts and check in with Master Yun. Wear comfortable you can move in. You will be barefoot on the mat. There will TaeKwonDo classes at 4:30pm (kids), 5:15pm (kids and teens), and 6:00pm (kids, teens, adults). There will be a HapKiDo class at 6:45pm. 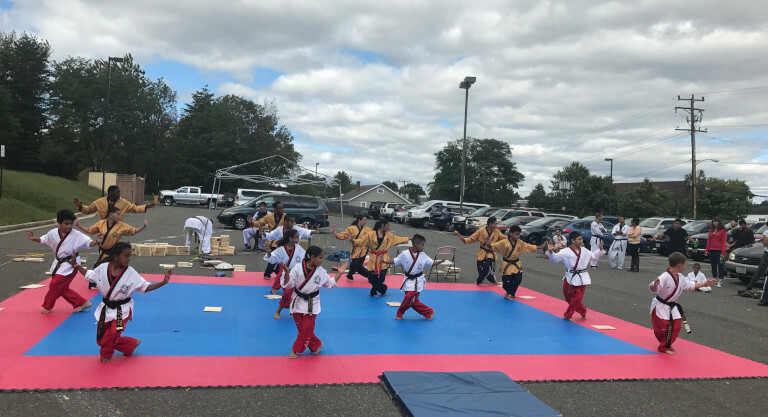 If you or your child is even a little bit interested in the martial arts, this is your chance to experience a real class, meet Master Yun, talk to some instructors, and meet other students. So come on down on Friday, October 5! There will TaeKwonDo classes at 4:30pm, 5:15pm, and 6:00pm. 10:00 – 11:00am – Free trial lessons. 11:00 – 11:30am – Demonstration by HapKiDo students. There will be techniques, self-defense and breaking. 11:30am – 12noon – Student demonstration. 12noon – 12:30pm – Performance by the Be Ryong demo team. There will be forms, breaking and self-defense. This event is free and open to the public. Bring the whole family! Be Ryong is located at 218 W. Glebe Road, Alexandria, VA. The studio is located on the corner of Mount Vernon and W. Glebe, in the same shopping complex as the Food Star grocery store. There is plenty of free parking! We include basic unarmed defense against a variety of attacks in the Be Ryong curriculum (especially HapKiDo), but let’s face it: if you have the chance to run, that’s your best option. Join us while we practice this valuable skill at the Crystal City 5K on Friday, April 6 at 6:00 PM. Register now! This is the Friday in April during which taekwondo belt testing is going on at the dojang, so you won’t even miss a class! Let Chris Murray know if you are registered and he’ll work out the group logistics. This is the 4th year that we’ve run this as a Be Ryong team. We typically gather before the run to warm up together. There are several of us doing this, and we run at a couple of different paces, from near light speed to very casual. You can run with one of us, or on your own. Afterwards, we’ll grab some pizza or something in Crystal City. If you have any questions about logistics or even just want some advice about preparing for running in general, feel free to ask Chris or Laura Murray, our resident running enthusiasts. We hope to see you there! Register now! 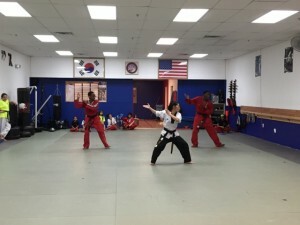 At the request of many students, Master Yun has decided to offer women’s self-defense classes! The classes will teach women and girls the basics of disarming an attacker and getting away; getting away from wrist grabs; and the basics of pressure points. These will NOT be martial arts classes; these will be down and dirty moves for protecting yourself. Classes will be held at Be Ryong Martial Arts at 218 W. Glebe Road, Alexandria, VA. Classes are $20 per class, per person. There will be overlap between classes but if you want to deepen your knowledge of techniques, sign up for multiple classes! These classes are appropriate for women and teenage girls. Don’t be a victim! 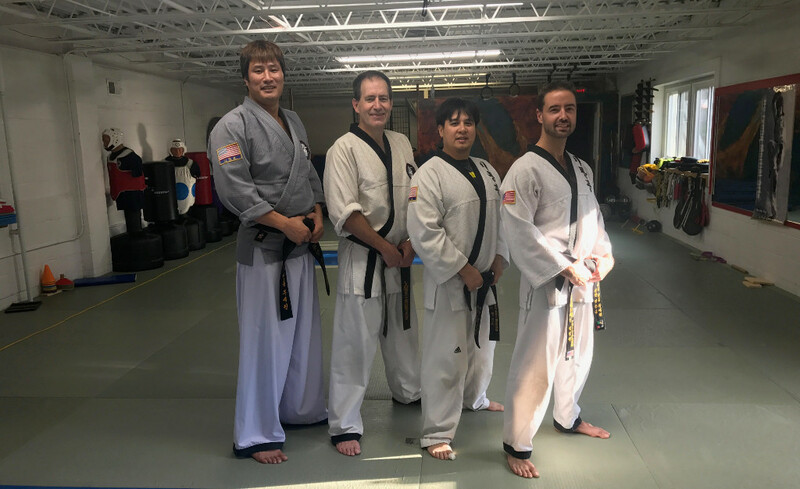 James, Jess and Chris with Master Yun at the end of the HapKiDo black belt test on December 16, 2017. Congratulations to James, Jess and Chris! James passed his third degree HapKiDo black belt test, while Jess and Chris passed their 2nd degree HapKiDo black belt tests. It was a grueling 3 1/2 hour test last Saturday. The candidates performed all the techniques for 1st and second degree, while James had to perform 3rd degree techniques as well. They did zillions of push-ups and sit-ups, broke boards and fought against other black belts during yusul. The highlight of the test was the power breaking, or the breaking of cement slabs with hand strikes. James successfully broke 3 cement slabs, while Jess and Chris broke two. Amazing! James is the ONLY student to ever take and pass a third degree test at BeRyong; James is also a 2nd dan in TaeKwonDo. Jess is also a 2nd dan in TaeKwonDo, while Chris is a first dan in TaeKwonDo. Congratulations! You can see photos and videos on the BeRyong Facebook page. Please like, comment and share! You can also watch most of the test on YouTube! Daniel recorded the test using his GoPro! It’s a really big deal when someone takes their 2nd degree black belt test. At Be Ryong, it takes an average of 3 years to get your first degree black belt, and then an additional 5-7 years to get your second degree. Why so long? The curriculum is much harder: all the kicks are jumping kicks, the forms are long and complicated, and the conditioning needed to take a 2nd degree black belt test is off the charts. But 12-year old Mac is taking his 2nd degree black belt test on Saturday, December 2, 11am. This test will run at least three hours, most likely longer. So come on down, cheer Mac on, keep him motivated during the 1,000+ push-ups and sit-ups he’ll have to do, and cheer him on during the intense sparring he’ll have to endure. And as always, bring snacks because it’s going to be a long test.